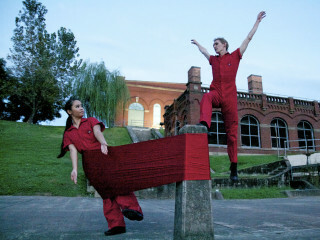 Karen Stokes Dance presents Sunset at White Oak Bayou, a site specific work at White Oak Bayou. With original music by Brad Sayles , played live by Heights 5 Brass, Karen Stokes Dance brings to life Houston's origins in its original setting. Stokes is making it her mission to bring Houston history alive in the very spot the Allen's Brothers stepped ashore, on the banks of White Oak Bayou as it merges with Buffalo Bayou. This site, the original Port of Houston, (now renamed Allen's Landing after its founders) has been a central focus of Stokes' work for two years. Location is Wood Street between N. Main & San Jacinto., under University of Houston Downtown. For reservations, visit www.karenstokesdance.org. Admission is free, but reservations are recommended.